My family will be flying from Seattle to Honolulu June 21/22 to June 29/30. Current prices are $650 nonstop, $500 1 stop. Should I purchase the airfare now, or wait to if prices fall? Thanks! $428 on United one-stop good connection or $622 on Hawaiian nonstop. Both very fair prices. Might improve some by waiting since that is such a competitive market right now. If you are comfortable waiting on the unknown, it probably won’t get worse. If you have any flexibility to get to mid-week your changes of a better price increase significantly. Hope that helps. Traveling from MSP to HNL and then departing from OGG. Travel January 18-January 27 2019. When is the best time to book flights? What is a good price? We typically fly Delta? Sun Country will obviously be cheaper, but your preference is noted. Looks like the best price may be in the $700 range. If you have any flexibility on your exact dates, that “might” help. Delta isn’t really competing with Sun Country, so unfortunately there isn’t anything great in terms of price. 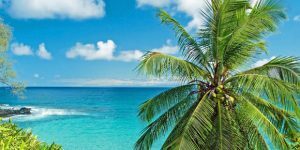 Going from Albuquerque to Lihue from March 17-23, 2019. I had been holding out hope that Southwest would be flying to Lihue by then but things no longer sound promising. Should I book now on American for $850 or hold out for Southwest or a better deal? Best thoughts on this might be to wait. Seattle has had good airfares even in summer the past couple of years. No reason to think that will not continue. Target airfare is low to mid $500’s for non weekend travel in peak summer. Planning 1st trip to Hawaii, have a cruise booked first week of 5/19. Flying from PIT, have been waiting for SWA to announce service from one of the four cities previously indicated to HNL for months. SWAs new flight schedule is supposed to drop 9/27, which would cover my dates to one of those four gateway cities. No idea which one to pick other than by $ factor. Would need to book a hotel overnight to grab flight to HNL the next day. Not sure if one would be easier than the others in that regard. Who knows if service to HNL will be finally offered, seems to be dragging. Note to self to make sure HNL flies out of all the announced gateway cities JIK! SWA prices tend to be lower the first day for previous flights i’ve Booked to the west coast (LAX, SNA & BUR). If i see what is a good rate would like to jump on it. If it drops can use credit before it expires on another trip but that’s pushing into 4th of July annual trip for me, when fares bump quickly. Can’t sit on it too long. I am on the fence whether to book the first flight leg I need on the SWA release date; even if HNL schedule is not announced. Plan was to overnight in whatever city both ways to break up the long flight from PIT. Some of those gateway cities will have connections, yuck. Was thinking of booking whatever eventual flight to HNL on last the last Sunday, Monday or Tuesday of April, hoping those dates would be less expensive, should be missing spring break time frame. C) just book what is usually a less expensive fight to LAS or LAX on SWA. Although LAS doesn’t seem to get much LUV haha. Then, resign myself to booking to HNL on Hawaiian when i see a decent deal (whatever that is ? $500 RT pp) Additionally, any guesses when i’d See deals to HNL for end of April, early May for 2019? New territory never visited Hawaii, feel like i’m missing something importanthere. Need all the expert help i can get! Will we ever see any specials from Las Vegas to HNL… We never get anything I’m looking to fly Nov. 8th -13th. That market is definitely a bummer in terms of price. Looks like $500 to $590 RT. Doubtful of it improving right now, but we wouldn’t be surprised to see some Southwest effect on that route sometime soon. Hi, we’re taking a trip to Honolulu in March 2019. We would be flying from Raleigh. How soon should we book? There are no good deals now, most fares are $700-800 as of now. Any advice would be greatly appreciated!! Thank You!! By mid-March it is spring break so no deals. Prices in the mid $500’s until then start to head up by as much as $300 RT. If you’re traveling in spring break probably best to buy now. For travel completed in first half of month, while mid-$500’s is very good, it could even improve a bit if you wait. Flying from the Baltimore to Hilo in late February 2019. Is it best to buy 1 ticket now or wait until around mid-late November of 2018 to book? Also, what cities or connections would be best for the route, flying with United. Fares for February should drop by $150 or more round trip if you wait. Can’t say when that will occur or if it is a certainty. But target price is just under $600 RT. Suggest waiting, especially for mid-week travel. We are planning to go to Honolulu from Los Angeles for 6 person on first week of July of 2019. When is the best time to buy the tickets. Hard to say right now due to SWA coming on board by then. You can try waiting, but it could backfire. Generally (were it not for new airline entering mix) best to buy those as close to 11 months in advance as possible. Target price with new competition is about $500 RT. We’ll see what happens. Hi, Looking to fly from Sacramento to Maui 4/19-4/27…flights now are around $600…when do you think would be the best time to buy considering Southwest should come on board soon? 6 weeks out? Or is that too little lead time?? It would be best to wait. Yes SWA should be flying here then. That is off-season and you are fine to wait pretty much as long as necessary. Target price is in the $300’s RT. It looks likely to be $1800-$2200 depending on airline in first class. Tickets will be available 330 days in advance. September is a great time for every reason and no dates to avoid. I am planning to take my granddaughter to Oahu for he 18th birthday and graduation in December…the 11th to 20th. What do you think will be the ;lowest prices I could anticipate and about when? Thank you so much. You didn’t say where you are traveling from but your IP address says Tampa, FL. Price is low to mid-$800’s on multiple airlines with fast connections. Suggest buying at that price now since you’re return is at cusp on holidays. Planning a surprise, for my retiring policeman husband, in early November. 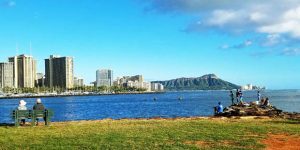 From Phoenix to Oahu to see as many Hawaii Five-O sights as possible! Fares dropped significantly from yesterday to today. Will they continue to drop? Should I go ahead and purchase now? Advise please, I’ve never done a surprise this big before! $537 RT nonstop as of today. Okay price, not great. Could go up and down between now and then. It’s old bird in hand dilemma. Hard to suggest which direction to go but if you want a gut call, it would be to wait with target in mid $400’s. Hi looking to go back to Hawaii next September from London or Glasgow. Could you tell me when is best to book flights as I am booking flights and accommodation seperate. Have always booked with travel agent. Right now would be a good time to start looking. I travel from Boston to Maui every year. You usually only talk about west coast airfare. Do you have any information about how the upcoming airfare wars will effect travel from the east coast? 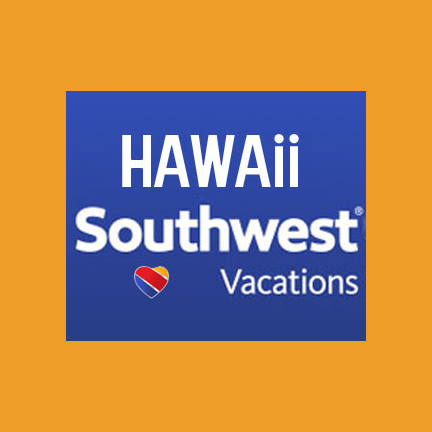 How Southwest may impact fares from beyond the west coast was updated in today’s post: https://beatofhawaii.com/flight-to-hawaii-cost/. We will know more soon. Come whenever and I’m so confused on which hotel !!! Any advise? Are there waterfalls? 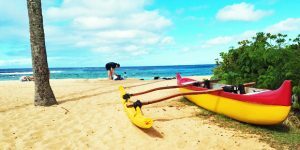 Best time to see North Shore waves? Thanks! Best to get the Oahu Revealed guidebook online, paperback or at library. The bible of Hawaii travel. Don’t stress too much. It is kind of hard to go wrong. If nature and good weather are a priority, is it worth the trip to Maui at the added cost? Thank you for your help once again! To answer your Oahu questions, do yourself a favor and get the Oahu Revealed guidebook. You won’t be sorry. Weather probably won’t be better on Maui than on Oahu. You’re coming in winter so good weather is possible, but so is some rainy weather. To be expected and no one can predict that. I plan to travel to Hawaii January 2019, dates are flexible, from the Baltimore/Washington DC area. Planning on flying into HNL and out of OGG. Currently, round trip flights are $611.00 +luggage. Is this a good deal or do you advise to wait? Additionally, I know winter is rainy season over there. Is there a certain area of Maui that shouldn’t experience as much rain? Good weather is important to us. Thank you! That is a very good price for east coast. If times, and stops/duration are to your liking, wouldn’t wait. Don’t wait on booking inter-island flight as best times book up or become expensive fast. Yes January is winter here as it is there. Hard to predict weather, but if this helps, January is called the Snowbird season. It’s when people from more northerly climates come to enjoy the warmth of Hawaii. The Kihei/Wailea/Kaanapali side of Maui have dryer weather. You’ll even see cactus growing. But if there is a winter storm, it can impact any area to be honest. Chances are you’ll be fine. So come and enjoy! I am so happy to have found this website as you have already helped me enormously! My family of 6 will be traveling from STL to HNL end of May/early June 2019 to make our blended family official!! I am looking at both direct flights from STL to HNL and at all the options from STL to the east coast (California, Oregon, Washington) and from there to HNL. 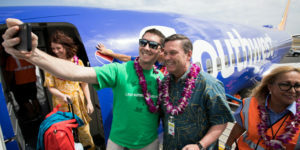 Do you think the addition of Southwest flight will affect the pricing of direct Midwest to Hawaii flights or just those departing from California? Thank you! Yes it certainly seems that the new SWA flights will impact on pricing from beyond their California gateways. Your best buying opportunity is probably going to start closer to year end. Our family of 5 needs flight to Oahu for Dec. 20-31. Our closest major airport is New Orleans. I’ve looked every major airport that we can fly out of by piecing the trip together on our own. I’ve priced LAX to HNL on any of those airlines with us probably using Southwest to get to LAX. The current lowest price for LAX to HNL is $782 on Hawaiian. How long should I wait to purchase this airfare? I was hoping Southwest would be operating by then, but just don’t know if it’s going to happen.